The San Luis Obispo County Narcotics Task Force as we know it is no more. Despite an effort by the California Department of Justice to salvage as many of its regional anti-drug and gang task forces as possible, the department announced it would officially cut two-thirds of its forces as it faces a funding cut of more than $70 million in January. 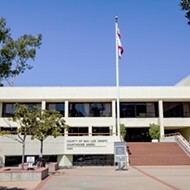 California Attorney General Kamala Harris warned in July that the agreement would essentially gut the DOJ’s Division of Law Enforcement budget, requiring the elimination of its two investigative bureaus, the Bureau of Investigations and Intelligence, and the Bureau of Narcotics Enforcement, under which the SLO County NTF is run. Over the last few months, regional task forces across the state have been trying to come up with enough funding to continue their operations at the local level. Gledhill added the Attorney General’s Office will continue to lobby for flexibility in the upcoming budget cycles. Regional units such as the SLONTF are a special kind of law enforcement entity, which officials say play a crucial role in battling drug trafficking by allowing investigations to span across county boundaries. 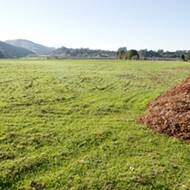 SLO County’s task force has received state funding, uninterrupted, since 1976. The task forces are a consortium of local police departments and state agencies, which—up until now—received special funding from the state. They are headed by a local board of governors comprised of chiefs from each police department as well as regional heads of state agencies, all under the supervision of a DOJ regional commander. 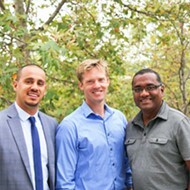 Current participants in the SLONTF include the San Luis Obispo, Atascadero, Paso Robles, Arroyo Grande, Grover Beach, and Pismo Beach police departments; the Cal Poly University Police; the Sheriff’s Department; the District Attorney’s Office; the Probation Department; California Highway Patrol; and California State Parole. 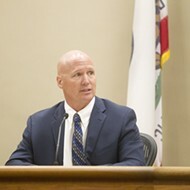 Pismo Beach Chief of Police Jeff Norton, who chairs the NTF’s board of governors, told New Times he received word from the chief of the DOJ’s Division of Law Enforcement, Larry Wallace, right about the time Wallace told the Associated Press that the division would only be able to afford 18 of its 52 task forces. Wallace told the AP that those 18 will be saved only by money the state receives from the federal government, and said the rest may live on in some fashion through efforts by local organizations. Currently, each of the county’s police departments contributes to the NTF, either in manpower or with funding, with the exception of the Morro Bay Police Department. 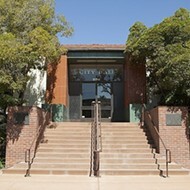 Because of the elimination of the DOJ’s two investigative bureaus, the SLONTF’s regional commander position will be terminated, as will money for the lease on the San Luis Obispo office, Gledhill said. She did not disclose whether the previous commander, Rodney John, was laid off or whether he will be transferred to another assignment within the DOJ, citing personnel confidentiality. New Times was told by a receptionist at the SLONTF’s San Luis Obispo office that John, an active member of the military, has been on deployment overseas for at least the last month, and could not be reached. In 2010, the local NTF operated on a budget of approximately $370,000, not including contributions made by participating local police departments. Norton said roughly $70,000 of those funds covered the lease of an office in SLO, and the majority of the remainder covered salary and benefit expenses for the NTF commander. According to Norton, in the same year, the NTF was involved in 205 “major activities,” which included investigation activities and providing manpower or otherwise contributing to neighboring task forces’ operations. He said the local NTF conducted 94 investigations of its own, which resulted in 75 arrests. 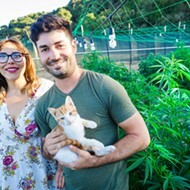 That’s a cost of about $4,930 per arrest, though a spokesman for the SLO County District Attorney’s Office could not be reached to confirm how many of those arrests resulted in convictions. Though the task force costs money to operate, it also brings money in. Figures for 2010 have not yet been published, but in 2009, local NTF investigations netted approximately $331,800 through civil asset forfeiture cases. Those monies were distributed throughout the county and state; roughly $78,000 to the county’s general fund, $32,200 to the D.A.’s Office, and $98,500 for its own operations. In addition, 15 percent of that total pays for anti-drug education and rehabilitation services in the county. But the de-funding of the state-run task force does not necessarily mean local law enforcement will lose its means to coordinate complicated inter-agency narcotics investigations that net money for local agencies. Sheriff’s Department spokesman Rob Bryn said local law enforcement was made aware the hammer would come down back in July, when they began planning the next step. SLO County Sheriff Ian Parkinson told New Times he agreed at the NTF’s board of governors meeting last week to “take the lead” in incorporating the long-allied resources and officers into some form of an expanded local narcotics unit—this time under the direction of the Sheriff’s Department. Over the course of the next month members of the Sheriff Department’s narcotics unit will work with officers currently assigned to the task force to begin evaluating what remains of the NTF’s funds and resources. Though he added that the formation of the new task force would only work if it could be done at no additional cost to the departments involved, Parkinson said an audit of the NTF’s budget and perhaps pending NTF-inspired civil forfeiture cases could allow for some flexibility in the transition.